Does long-distance air travel associated with the Sevens World Series increase players’ risk of injury? Objective To assess whether players who cross ≥6 time zones and/or undertake ≥10 h air travel prior to competition experience a higher risk of injury during the Sevens World Series than players not required to undertake this level of travel. Design Five-year, prospective, cohort study. Participants All players from nine core teams competing in the Sevens World Series from 2008/2009 to 2013/2014. Results A total of 436 match injuries and 3363 player-match-hours of exposure were recorded in the study, which corresponds to an overall incidence of 129.6 injuries/1000 player-match-hours, irrespective of the nature of pretournament travel. The incidence of injury for those players crossing ≥6 time zones and undertaking ≥10 h air travel prior to competition (99.3 injuries/1000 player-match-hours) was significantly lower than that of players undertaking ≥10 h air travel but crossing ≤2 time zones prior to competition (148.8 injuries/1000 player-match-hours; p=0.003) and of those undertaking ≤3 h air travel and crossing ≤2 time zones prior to competition (146.4 injuries/1000 player-match-hours; p=0.004). There was no significant difference in the incidence of injury for players crossing ≤2 time zones in the week prior to competition, irrespective of whether the length of air travel was ≤3 h or ≥10 h (p=0.904). Precompetition air travel had no significant effect (p=0.879) on the performance of teams in terms of their final Tournament ranking positions. Conclusions There was no evidence to suggest that players were exposed to a greater risk of injury following extensive air travel and crossing multiple time zones prior to Tournaments in the Sevens World Series. If long-distance travel by athletes does increase the risk of injury as a result of sleepiness and/or reduced mental and physical performance, it might manifest itself during the Sevens World Series. Rugby-7s is a full contact team sport and the Sevens World Series requires players from competing countries to undertake extensive air travel in the week prior to the tournaments. The format of the Series involves countries playing four to six games over a period of 2 or 3 days at each tournament, which are normally scheduled as back-to-back pairs in consecutive weeks with a 6-week to 8-week rest period between each pair of tournaments. For the first tournament of each pair, players/teams travel from their home country to arrive at the location on the Monday/Tuesday prior to the tournament starting on Friday/Saturday. This necessitates most players undertaking long-distance air travel that may involve flights of up to 12 h and players may cross up to 12 time zones depending on the locations of their home country and the tournament. For those tournaments following on from the first tournament, players from all countries usually travel on the Monday following the first tournament as the follow-on tournament takes place over the next weekend. Therefore, while players from each country may experience different travel schedules prior to the first tournament, they experience the same travel before the follow-on tournament. Irrespective of the travel requirements, all players have similar recovery periods from their time of arrival to the start of the tournament. The increasing popularity of Rugby-7s has created a demand for more tournaments to be added to the Sevens World Series. It is, therefore, important to investigate the effect of long-distance travel on the risk of injury to players. The aim of this study was, therefore, to investigate whether Rugby-7s players crossing ≥6 time zones and/or undertaking ≥10 h air travel to compete in the Sevens World Series are at greater risk of injury than players based near to the tournament location who consequently cross ≤2 time zones and/or undertake ≤3 h air travel to reach the tournament location. These travel categories were designed to reflect the travel requirements of Rugby-7s players competing in the Sevens World Series. Category-A represented a level of travel that would not be expected to cause travel fatigue or jet lag; Category-B represented travel that could lead to travel fatigue but which should not cause jet lag; Category-C travel represented travel that could lead to travel fatigue and jet-lag effects that would require more than 5 days for recovery.1–9 It was anticipated, therefore, that Rugby-7s players undertaking pretournament Category-C travel might still be affected by jet lag while competing in the accompanying tournament, as this normally takes place within 5 days of arrival at the tournament location. All travel times were based on the teams’ scheduled flight times between locations. Travel related to the first tournament in a group was categorised on the basis of travel from the country's home location; travel related to follow-on tournaments was categorised on the basis of travel from the previous tournament's location. pretournament team-travel would be spread evenly across the three travel categories; five Sevens World Series would provide ∼2600 player-match-hours of exposure with ∼850 player-match-hours in each travel category. The design was a prospective, cohort study covering the 2008/2009, 2010/2011, 2011/2012, 2012/2013 and 2013/2014 World Series. Players’ anthropometric (age, body mass, stature), match injury (body location, tissue type and nature, cause, time of onset) and match-exposure data were collected for nine (Australia, Canada, England, France, New Zealand, Scotland, South Africa, USA and Wales) teams competing in the World Series. These countries were included in the study for a number of reasons including: (1) players provided a homogeneous population, in terms of body mass and stature; (2) countries provided similar standards of medical and sports science support; and (3) countries provided travel patterns representative of the Northern and Southern hemispheres. Prior to the start of each Series, a manual containing study definitions and procedures was sent to the medical staff representing each country: the definitions and procedures were compliant with the international consensus statement for epidemiological studies in rugby.22 An injury was defined in this study as: “Any injury sustained during a Sevens World Series Tournament match that prevented a player from taking a full part in all training activities and/or match play for more than one day following the day of injury”; severity was defined as: “the number of days a player was injured—a player was deemed to be injured until he could undertake full training and be available for match selection, whether or not he was actually select”. Match exposures were calculated on the basis of seven players/team exposed for 14 min/match (20 min/match for each tournament final); no allowances were made for players temporarily (medical treatment, yellow card) or permanently (red card) removed from a match. Team doctors/physiotherapists recorded injury details: players’ rehabilitation was followed up post-tournament to obtain the return-to-play/training date. In the few cases where injuries remained unresolved 3 months after the final tournament of a Series, team doctors/physiotherapists provided an estimated return-to-play/training date based on the diagnosis and clinical judgement about the player's rehabilitation time frame. For the 2013/2014 Sevens World Series, the teams were also requested, for each tournament, to record after their arrival at the tournament location the time (minutes) that players spent training on non-match days under the activity headings: warm-up, cool-down, rugby-skills-contact, rugby-skills-non-contact, conditioning-weights, conditioning-non-weights and other. Seven of the nine countries provided training exposure data. Average daily training exposures (day 1 being the day of arrival at the tournament location) and training content were calculated in minutes for each pretournament travel category in order to provide an indication of whether the length/content of training schedules varied as a function of the pretournament travel category. As an indication of whether countries’ playing performances were affected by the pretournament travel requirements, three average tournament ranking positions (averaged over the 5 Series) were calculated for each country—one for each of the pretournament travel categories. Tournament ranking positions were calculated using the 2013/2014 Sevens World Series ranking schedule.23 This provided nine average ranking positions (1 for each country) for each of the three travel categories. The overall average (SD) ranking position for each of the three pretournament travel categories was then calculated from the average ranking values of the nine countries. Players’ baseline data are summarised as means (SD), incidence of injury as injuries/1000 player-match-hours with 95% CI, injury severity as the mean (days; 95% CI) and median (days; 95% CI).20 One-way analysis of variance was used to identify differences in players’ anthropometric data across the five Series; χ2 tests were used for differences in numbers of injuries; Z tests for differences in incidence, mean severity and proportions of injuries; and the Mann-Whitney U test for differences in the median severity of injuries.20 Exact p values are reported and because of the number of statistical tests undertaken, statistical significance was considered a possibility if p≤0.010. In total, 563 players (backs: 351; forwards: 206; not known: 6) from the nine countries were included in the study; of these, 352 players took part in one Series; 111 in two Series; 59 in three Series; 20 in four Series and 21 in five Series. Table 1 shows the mean (SD) for age, stature and body mass of backs and forwards competing in each Series. There were no significant differences in the age (backs: p=0.086; forwards: p=0.253), and stature (backs: p=0.434; forwards: p=0.393) or body mass (backs: p=0.560; forwards: p=0.173) of the sample populations across the five Series. In total, the nine teams reported 436 match injuries (first tournaments: 215; follow-on tournaments: 180) and recorded 3363.2 player-match-hours exposure (first tournaments: 1713.8; follow-on tournaments: 1407.5) during all games played within the five Sevens World Series, which is equivalent to 129.6 injuries/1000 player-match-hours (95% CI 118.0 to 142.4). There was no significant difference (p=0.490) in the incidence of injuries sustained during first (125.4 injuries/1000 player-hours; 95% CI 109.7 to 143.3) and follow-on (134.0 injuries/1000 player-hours; 95% CI 117.5 to 152.9) tournaments (irrespective of the pretournament travel category). The numbers of match injuries, exposure and incidence of injury as a function of the pretournament travel categories are reported in table 2. All clubs contributed to the total number of injuries and player-match-exposure in each of the three travel categories; the mean and median numbers of injuries/club and player-match-hours of exposure are also shown in table 2. There was no significant difference (p=0.779) between the overall incidence of injury associated with the travel categories (127.0) and the incidence of injury recorded by the nine teams during all the games they played during the five Sevens World Series (129.6). There was no statistically significant difference (p=0.904) between the incidences of injury sustained by players following pretournament travel in Categories A and B. The incidence of injury following pretournament travel in Category-C was, however, significantly lower than that observed for Categories A (p=0.004) and B (p=0.003). There was no significant difference (p=0.653) in the incidences of injury when the pretournament travel included in Category-C was separated into East-to-West (93.8 injuries/1000 player-hours; 95% CI 68.3 to 128.9) and West-to-East (102.7 injuries/1000 player-hours; 95% CI 81.0 to 130.3) travel. The mean and median severities of injuries sustained by players for each of the pretournament travel categories are shown in table 3. There are no significant differences between any of the travel categories for either the mean (p values range from 0.177 to 0.596) or median (p values range from 0.744 to 0.991) severities of injury. The distributions in terms of location and type of injury are shown for each of the pretournament travel categories in tables 4 and 5, respectively. There are no statistically significant differences between travel categories for any of the locations or types of injury. The playing position, nature, cause and time of onset of injury and the match activity leading to injury are presented as functions of pretournament travel categories in tables 6 and 7, respectively. If injury was the result of random events, then based on the number of backs (4) and forwards (3) in a Rugby-7s team it would be predicted that backs should sustain 57.1% of all injuries and forwards 42.9%; these predicted values fall within the 95% CI values for each of the three pretournament travel categories. There are no significant differences across the pretournament travel categories for the nature, cause or time of injury onset. There are also no significant differences in the match activities causing injuries as a function of pretournament travel category. The average tournament ranking positions for the nine teams during the five Sevens World Series are shown with respect to the pretournament travel categories in table 8. There are no significant differences (p=0.879) between the average ranking positions as a function of the pretournament travel category. Only one of the nine countries (team 1) showed a trend indicating that tournament performance may be affected by travel. The average non-match-day training exposures for all players on non-match days are shown as a function of the pretournament travel category in figure 1. 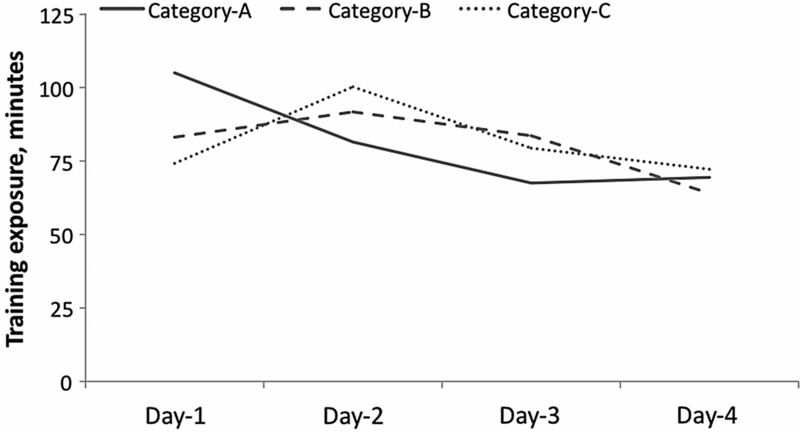 Training exposures varied between 70 and 100 min but there are no significant differences between the travel categories in the total amount of training undertaken over the 4 days (Category-A: 323 min; Category-B: 322; Category-C: 326). The training exposure on day 1 following pretournament travel in Category-A was higher than that on day 1 for Categories B and C; this may reflect an earlier time of arrival at the tournament location for those countries not required to undertake long distance travel, which would provide these countries with more time for training. Figure 2 shows the average composition of teams’ non-match-day training on a daily basis as a function of the pretournament travel category. There are no significant differences between the three travel categories in the overall content of the training undertaken: rugby-skills-non-contact (Category-A: 34.4%; Category-B: 34.9%; Category-C: 35.0%), conditioning-weights (Category-A: 20%; Category-B: 26.5%; Category-C: 21.4%) and rugby-skills-contact (Category-A: 15.7%; Category-B: 15.5%; Category-C: 13.5%) provided the main training components. Average, non-match-day, daily training exposure (minutes) as a function of team's pretournament travel category (day 1 equates to the team's day of arrival at the tournament location; day 5 normally represents the first day of competition). Average composition of non-match-day, daily training programmes as a function of the pretournament travel category (day 1 equates to the team's day of arrival at the tournament location; day 5 normally represents the first day of competition). Only five training injuries were recorded by the seven countries reporting training data during the nine 2013/2014 tournaments. Further analysis of training injury data was, therefore, not justified. This is the first study to assess the potential impact of travel fatigue and jet lag on the incidence of injury among elite athletes. Best practice advice on air travel indicates that 4 days should provide sufficient time for players to recover from the effects of travel fatigue and travel across 4 time zones.1–9 While travel fatigue and jet lag should not, therefore, impact on Rugby-7s players in many of the Sevens World Series tournaments as they involve players crossing ≤4 time zones,1–9 there are other tournaments where players have long-distance travel across ≥4 time zones. In industry, it has been reported that sleep deprivation slows employees’ cognition and psychomotor performance leading to increases in errors of omission and commission.24 If there was insufficient time for players to recover from the effects of jet lag, they might be at an increased risk of injury. The injury risks in 15-a-side rugby have been quantified,25–27 but it is conceivable that reductions in players’ normal levels of cognitive and psychomotor performance, as a consequence of jet lag, could increase their risk of injury. Players exposed to the greatest pretournament travel burden (Category-C) exhibited a significantly lower incidence of injury than players in the other two travel categories; however, the reason for this is not obvious. It is possible that teams undertaking extensive travel prior to a tournament remain fatigued and jet-lagged during the associated tournament and did not compete at the same intensity as they would when not fatigued or jet-lagged; hence, they indirectly reduced their risk of sustaining an injury. If this were the case, one would expect it to be reflected in the team's tournament performance. There was, however, no significant difference in tournament performance (in terms of final tournament ranking) when teams undertook Category-C travel compared to Category-A and Category-B travel. In addition, analyses of all the other risk factors associated with injury indicated that there were no significant differences across the three travel categories for the severity, nature, cause or time of the injuries sustained. It could be argued that players competing near to home (Category-A) may compete at a higher intensity in order to win the tournament in front of their own supporters, consequently exposing themselves to a greater risk of injury. However, countries playing a long way from home also contributed to the match exposure and injuries included in this category. For example, in one set of paired tournaments, the first tournament took place in Scotland and the second tournament in England, which is a 1 h flight from Scotland and in the same time zone. In this case, the pretournament travel for all teams travelling from Scotland to England was classified as Category-A. There was no indication that the significantly taller and heavier forwards were exposed to a greater risk of injury after sitting on a plane for extended periods of time, as the nature of injuries sustained by forwards remained essentially the same across all pretournament travel categories. It might also be anticipated that when players sit on board a plane for extended periods of time (Categories B and C), they might subsequently sustain muscle strains due to restricted lower limb blood flow during the flight leading, for example, to muscle stiffness and cramps,3 ,4 ,16 but there was no indication that this was the case. Apart from small differences in exposure on the first day at a tournament location, the teams involved in this study undertook very similar training programmes irrespective of the pretournament travel category. It has been suggested that the timing of training sessions may impact on players’ ability to induce circadian phase shifts7 and a questionnaire has been developed to monitor training load and fatigue among Rugby-7s players.28 More detailed investigation of these factors may provide additional information to determine whether fatigue levels during the pretournament period are important. Forbes-Robertson et al7 specifically examined the issue of coping with intercontinental travel during the Sevens World Series and recommended avoiding heavy training for the first few days after travel across multiple time zones. These authors, however, emphasised that further research was required to define the optimum time, amount and type of exercise required for players to reset their circadian cycles. This study was not designed to monitor players’ physiological changes as a consequence of travel but to determine the possible effect that extensive pretournament travel may have on players’ risk of injury. In this respect, there was no evidence to suggest that players were exposed to a greater risk of injury or were likely to perform at a lower standard following extensive air travel and crossing multiple time zones. It is suggested that further investigations are undertaken in order to monitor players’ cognitive functions and training intensity in the days between arrival and competition to determine whether these factors are affected by travel patterns. The results and conclusions presented should be viewed in the context of the study's strengths and weaknesses. The data, which were collected as part of an on-going prospective injury surveillance study, complied with the international rugby consensus statement for the collection and analysis of rugby injury data. All data were collected and reported by qualified medical staff supporting the teams. There were no significant differences in the stature or body mass of the sample populations across the five Series and there was no evidence that players experienced a higher incidence of injury during follow-on tournaments compared to a first tournament. It was, therefore, deemed acceptable to pool the exposures and injury data from all tournaments in the five Series to generate a single sample population in order to achieve the statistical power required to achieve the aims of the study. All teams included in the study contributed to the match injury and exposure data included in each of the travel categories, and the similarities between the mean and median values indicate that the data were not skewed or biased to the injury patterns of any individual teams. The total exposure recorded was greater than that indicated by the sample size calculation; however, while the exposures recorded for Categories A and C were higher than required, Category-B travel was slightly less than required for an individual travel category. The training data collected only related to one season and did not record the intensity of training or the time of day when the training was undertaken. Does not increase the risk of match injury for the heavier and taller forwards in Rugby Sevens teams. 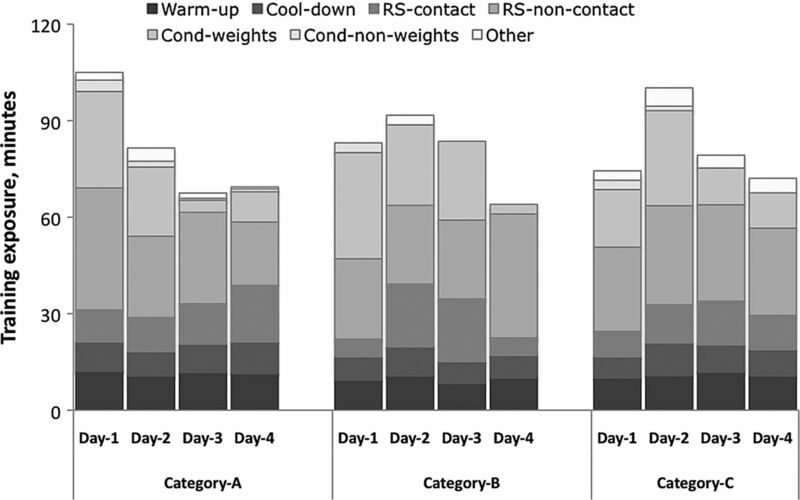 Monitor cognitive functions of Rugby Sevens players following long-distance travel. The authors acknowledge the contribution made by the tournament managers for facilitating and supporting the implementation of this study. The authors would also like to acknowledge the valuable support provided by the medical teams working with each of the participating teams who provided injury and exposure data. American Academy of Sleep Medicine. International classification of sleep disorders, revised: diagnostic and coding manual. Chicago: American Academy of Sleep Medicine, 2001.
. The effects of travel on team performance in the Australian national netball competition. JSMS 2004;7:118–22.
. Essential medical statistics. Oxford: Blackwell Science, 2003.
. Monitoring training load and fatigue in Rugby Sevens players. Asian J Sports Med 2012;3:175–84. Contributors CWF designed the investigation; developed the study protocol; reviewed the database; analysed the data; wrote the first draft of the paper; approved the final submission. AET implemented the study protocol; collected the data; reviewed the database; reviewed the first draft of the paper; approved the final submission. MR reviewed the study protocol; reviewed the initial results; reviewed the first draft of the paper; approved the final submission. Funding The study was funded by the International Rugby Board, Dublin, Ireland. Ethics approval University of Nottingham Ethics Committee.